2012/04/12 - Grönefeld present the "One Hertz Platinum"
Watchmakers Tim and Bart Grönefeld are proud to present the One Hertz Platinum, a remarkable timepiece which sees the One Hertz – the world’s first and only production wristwatch with independent dead seconds – receive an exclusive platinum case and cool blue dial. 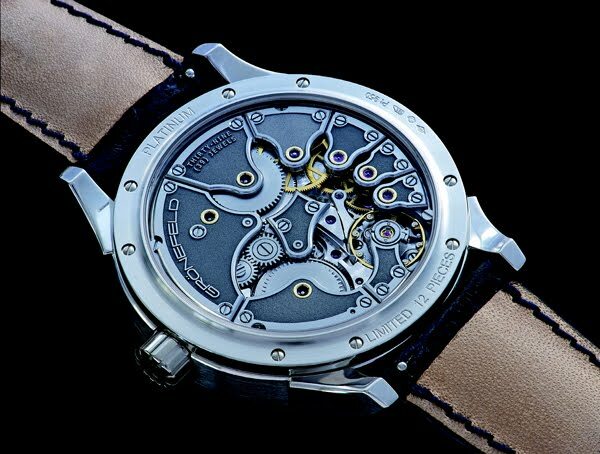 While rare, the dead seconds complication – secondes mortes in French – does exist. However, to date dead seconds have been derived from other mechanisms, usually a constant force device or remontoir d’égalité. The One Hertz Platinum features Grönefeld’s own proprietary movement of which all 285 parts are hand-decorated to the highest standards. The One Hertz indicates hours and minutes on a sub-dial at 2 o’clock; large sub-dial for the dead seconds; power reserve indicator at 12 o’clock; and an innovative setting-winding indicator at 3 o’clock. This ensemble of indicators is all the more striking thanks to the sophisticated blue dial background, which perfectly complements the regal tones of the precious metal platinum case. The One Hertz Platinum’s setting and winding is also extremely ergonomic, selected by pushing the crown in, rather than pulling it out. 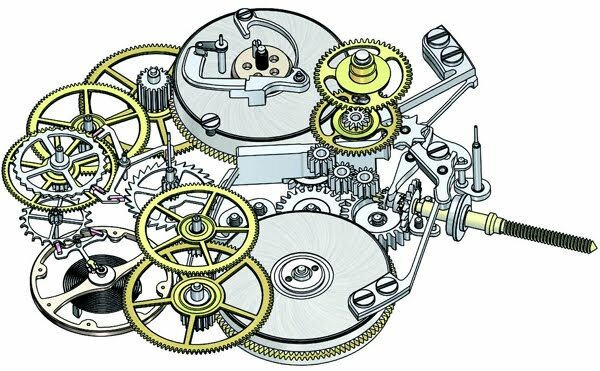 Dead seconds – where the second hand advances in full steps of one second instead of an apparently smooth sweeping action – was a very respected mechanical complication until the 1980s. However, its popularity then died with the dominance of quartz movements, which also stepped in full seconds. A smooth sweeping second hand came to differentiate mechanical from quartz. With the One Hertz and its unique secondary gear train, Tim and Bart Grönefeld have resurrected this long-neglected complication and re-positioned it where the complication originated: On the pedestal of high precision. The quartz-like movement of the large second hand of the One Hertz subtly signals its unique mechanism, invisible to most, but obvious to haute horlogerie connoisseurs, who will appreciate the sublime, flawless fine-finishing of the Grönefelds’ own calibre G-02. With the introduction of the pendulum in the 17th century, clocks finally became accurate enough to measure seconds. It was then not long before a hand indicating seconds on a long clock’s dial signified a precision timepiece. A pendulum with a period – the time to swing forward and back – of two seconds (the most common) resulted in a single tick per second. The invention of the balance spring, which replaced the pendulum, enabled miniaturization. As portable pocket watches became more accurate, watchmakers naturally thought to copy the one-second steps of the second hand which signified a precision timepiece; however, the rapidly oscillating balance meant that it could not be directly driven as with the pendulum, so it required either a new mechanism if independent, or be driven from another complication e.g. constant force device. While pocket watches have featured independent dead seconds in the past, the Grönefeld One Hertz was the first wristwatch featuring independent dead seconds. The Grönefeld One Hertz is unique among wristwatches in that its dead seconds are powered by a secondary gear train independent of the gear train for the hour and minute indications. Tim and Bart Grönefeld used an independent dead seconds mechanism that is driven from its own secondary gear train with its own power supply. The seconds are driven from one mainspring barrel and the hours and minutes from another. Friction is with this system guaranteed to an absolute minimum and the complication has no adverse influence on the escapement and free sprung balance. Hours and minutes in subdial at 2 o’clock, large seconds at 7 o’clock, power reserve, setting-winding indicator at 3 o’clock. Push function crown for winding or setting. Power reserve mechanism: Classic Breguet style by means of a cone moving up and down on the threaded barrel arbour. Case crafted in platinum, security screws, polished bezel and centre band with hand-finished straight graining. Top domed with antireflective treatment both sides, display back with antireflective treatment inside. Hours and minutes, long thin counter-poised seconds, power-reserve and setting-winding. 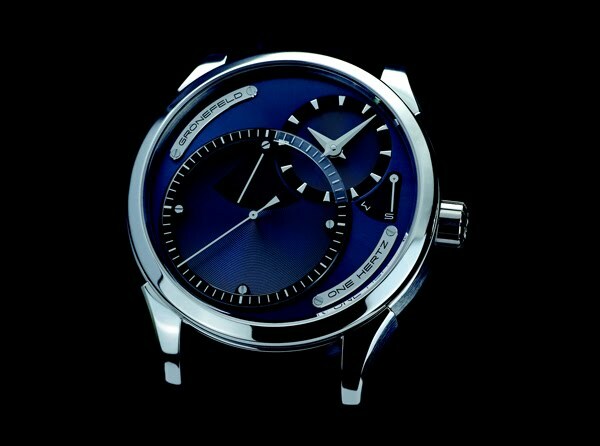 G-02, mechanical hand winding, independent dead seconds, power reserve Indicator and setting indicator. Independent mechanism, cam with 30 teeth on the going gear train on the second’s wheel, escape wheel on the seconds wheel of the independent gear train, double lever with jewelled pallets.